The Results of Following Advice! Here is MY BOOK on the shelves at a BOOK STORE! I called my local Third Place Books and after some email juggling, found out how to consign my print books on their shelves. Now, if people will buy them, I have an additional outlet for my work. 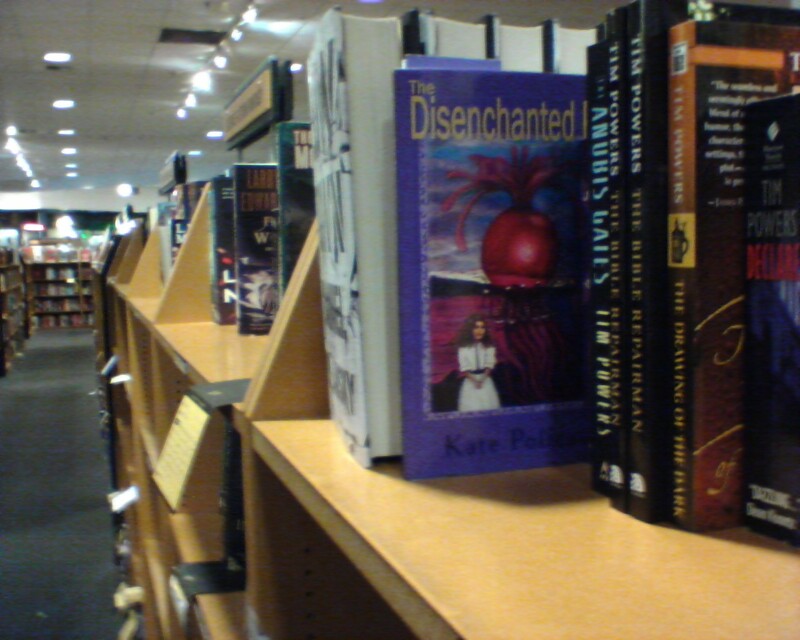 If you live in the Seattle area, check out Third Place Books on Lake City Way to buy The Disenchanted Pet in paperback from an actual shelf. Here is MY BOOK on the shelves at a BOOK STORE! I called my local Third Place Books and after some email juggling, found out how to consign my print books on their shelves! Now, if people will buy them, I have an additional outlet for my work! If you live in the Seattle area, check out Third Place Books on Lake City Way to buy The Disenchanted Pet in paperback from an actual shelf! I’m really enjoying your book so far, Kate. I didn’t know what to think of it at first because I never read a synopsis …. But as I kept reading, I couldn’t stop! I’m on chapter four or five. I wish I could get the book cover to show up in my Kindle, though. Bummer about these Smashwords books … When I download one, it never shows the cover on my e-reader. But I digress. Great work, I am LOVING it. 🙂 It reminds me of Ayn Rand’s Anthem, only with aliens. Thanks! I’m so glad you like the book! I’m sorry the cover isn’t working on your reader, too. I’ll have to check into that. So amazing, Kate. I hope I can come to you for tips one day if I ever self-publish something — you’re an amazing entrepreneur. And a massive CONGRATULATIONS. I think things are gradually branching out from us to the rest of the world. I hear news about expansion every week to international venues. Hang in there and keep writing. Remember–if you can see something good to do, do it! You’re never wasting your effort. Well Done!! So glad that actually works. was it hard to get them to do it?